Massive Goat Island sits in the middle of Powell Lake. To ride here, you need water transportation (boat, barge, raft, houseboat) to reach the Western Forest Products barge ramps and docks. This is a very active logging and road building area (think blasting) even on weekends. You can call the WFP hotline at (604) 485-3132, but for information about Powell Lake it's best to talk to someone in the office during the work week at (604) 485-3100. Wayne and I picked a sunny summer day to use our 25-foot barge to transport our two Yamaha Kodiak 450s for a day trip to Goat Island. The barge is large enough for three full sized quads. Nice when we want to go riding with friends. The barge travels at 7 knots, so it took us an hour to get from our float cabin in Hole in the Wall to the Goat Dock (also known as the Clover Dock). Wayne drove up to the barge ramp and we offloaded our quads. Because this is an active area, the ramp is in excellent condition. Then we moved the barge to the logging dock to tie up out of the way. Clover Lake with Powell Lake in the distance. We started up Clover Main with glimpses of Clover Lake to the left. I think I know how it got its name. I saw patches of clover growing in the moist soil. At the junction with the road Frogpond South we turned left and started a gradual climb. We stopped at a viewpoint for a drink and snack, and to enjoy the surroundings. The road took us through sections of second growth forest, and cut blocks in various stages of regrowth. Farther up ahead we could see the back side of the massive granite peak on the north end of Goat Island. This is home territory for Mountain Goats, but we didn't find any with our naked eyes. We rode as far as the south end of Frogpond. It sounds small, but is actually the largest lake on Goat Island. There are even a few float cabins tucked away in this secluded island paradise. We retraced our tracks back to the barge ramp. 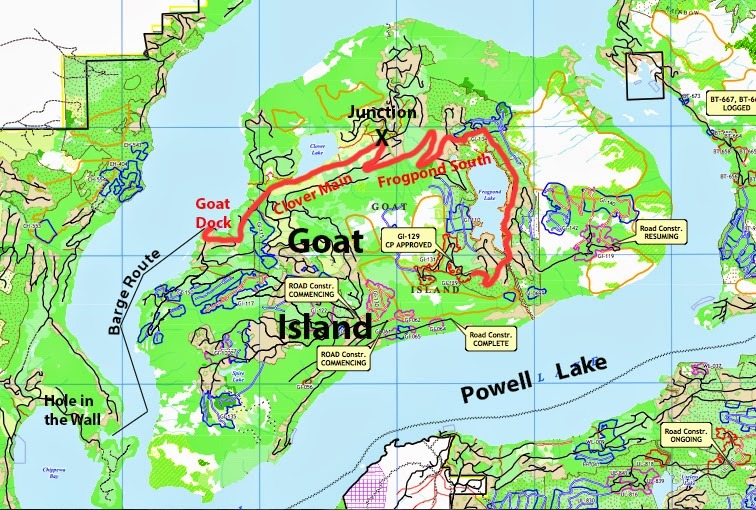 There are so many new and old logging roads on Goat Island I know we will be coming there again (and again). Thanks for coming along on our ride. If you have any questions, please leave a comment or send an email using the link in our profile.